We finally get a look at what our non-viking characters have been up to on this week’s episode of Vikings “Two Journeys,” which brought Bjorn to Rollo’s Francia and Ragnar to King Ecbert’s Wessex. The episode starts were we last left off with Ragnar and Ivar washed up on a beach unsure of where they are or if there were any other survivors from last episode’s shipwreck. That question is quickly answered when a group of water-logged men and women come walking down the beach. Ragnar’s mighty group of revenge seekers has be drastically reduced to a handful, but things begin to look up when they spot a group of English soldiers rifling through the wreck’s scraps. One of those men happens to be King Ecbert’s son Aethelwulf, so at least we know that Ragnar and Ivar have made it to England in one piece which is good news because the developments made in their relationship are the best parts of the episode. I have to admit the duo is growing on me even though Ivar still constantly whines and complains about how he’s different. Ragnar isn’t having any of that anymore though. He throws away Ivar’s leg contraption that allows him to somewhat be able to walk and tells him that his differences are what makes him powerful, he just has to believe it too. Most the episode focused on Ragnar and Ivar traveling to Wessex alone. But before they start on their trek, they slit the rest of their surviving crew member’s throats. Ivar being especially vicious rolling side to side axing people in their sleep and even stabbing a women begging for her life. Once the two are finished with their slaughter, they begin their journey to Wessex with Ivar riding piggy-back donkey style all the way there, but during their long walk, some interesting conversations come up about about Ragnar’s lost faith in the Norse gods. It all feels like a story coming to an end, Ragnar’s story at least and he’s prepping his son to take over the reigns. Which begs the question, can Ivar lead the show once Ragnar reaches his enviable end? Meanwhile back in Wessex, Aethelwulf is concerned with Ragnar’s presence in England because he knows that Ragnar is more than just one man, he’s the most dangerous man in the world. His father Ecbert is less concerned though because Ragnar is all alone thinking that there’s no need for panic. It was short scene, but it’s nice to see Ecbert back in the action. The episode wasn’t all Ragnar though, Bjorn and his fleet along with Floki, Helga and brothers King Harald and his brother Halfdan are sailing towards Rollo’s Francia kingdom. Their meeting doesn’t go all too well, at least not for Bjorn after Rollo introduces him to his wife Gisla and their three children and then locks him and everyone else in the dungeon. He also takes away Bjorn’s map of the Mediterranean to have a closer look himself. Something was definitely up with Rollo though, he was way too happy looking when he saw Bjorn’s viking fleet heading towards his shores. It turns out, Rollo seems really bored with Francia life. He wants to go with Bjorn, even bringing in a map expert with an expanded version of Bjorn’s map. Rollo shows Bjorn all the dangers that they will face during their travels and refuses to allow him safe passage through Francia lands. Unless Bjorn takes him with them, which is a confusing character development for Rollo considering how hard he fought against his own people last season when he married Gisla. That’s the problem with time jumps, we missed the many, many years Rollo has spent with Gisla, apparently having lots children, so we don’t know what is making Rollo turn back to his viking ways. Gisla hasn’t changed though, and makes it clear that her hatred of the viking people hasn’t died. She’s pissed off that Rollo wants to leave with Bjorn and even says that if her children were viking she would have killed them long ago. Well, Rollo ends up going with Bjorn, leaving a scored and heartbroken Gisla sitting on the throne with her three children alone. She tells Rollo that it’s the end of their marriage if he leaves, which he does, but I’m holding out hope for the two because they’re the only well-developed relationship the show has ever had. The episode ends with Ragnar and Ivar making it to Wessex, but we can tell that Ragnar’s at the end of his journey as the two walk (crawl) through the gates awaiting whatever fate Ecbert had planned for them. Lagthera has other plans though. 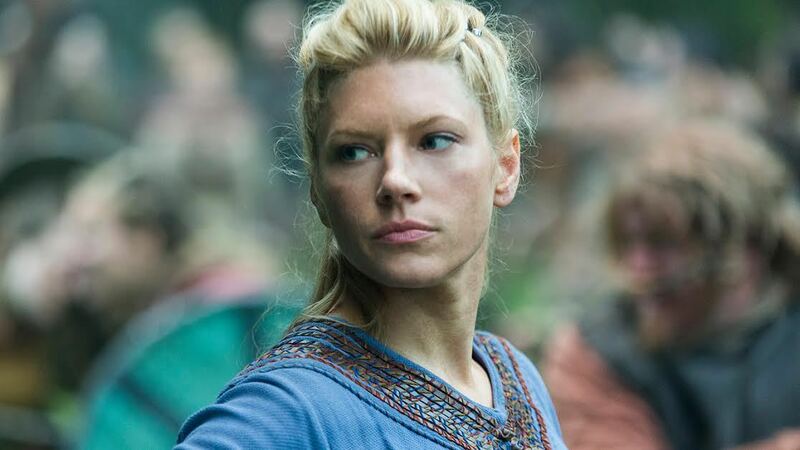 She has been secretly working with Torvi, Bjorn’s girlfriend, to take down Aslaug and regain Kattegat. She tricks Sigurd and Ubbe to have dinner with her, Astrid and Margaret, the servant-girl the brothers were using. The brothers find themselves locked in some sort of prison as Lagthera reins down on Kattegat with her army. Aslaug has seen this coming, and it is clear that she will surrender her crown. Lagthera’s army cuts through townsfolk until she orders them to stop claiming that they are “her people,” while Aslaug walks out of her home with a sword in hand leading, what it looks like, to an explosive opening scene in next week’s episode.